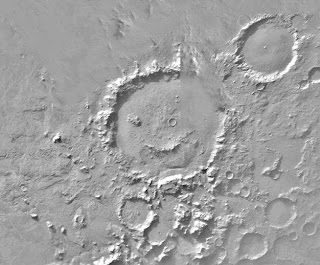 If you've seen or read 'Watchmen,' do you remember the crater on Mars with the smiley? Well, that's not just the writer's imagination. It's a real crater on Mars, known as the Galle Crater. When Alan Moore was writing 'Watchmen,' he was using the smiley as a motif/recurring symbol in the graphic novel, and when he found out about the Galle Crater, he thought it was too good a coincidence. He set some of the plot on Mars because of this, thinking that people would think it's too farfetched for a crater to be shaped like a smiley. Here it is on Wikipedia.